It is the last week of April. The weatherman didn’t get the memo. It was in the 40s when I left the house. I couldn’t bring myself to wear long pants. Suffice it to say, I was cold most of the way to work. I am less than two weeks away from the start of a week-long bike tour from Pittsburgh to DC so I thought it would be a good idea to try out the front low-rider rack on The Mule. The front rack made by Tubus has wider diameter tubing than my old Blackburn rack. 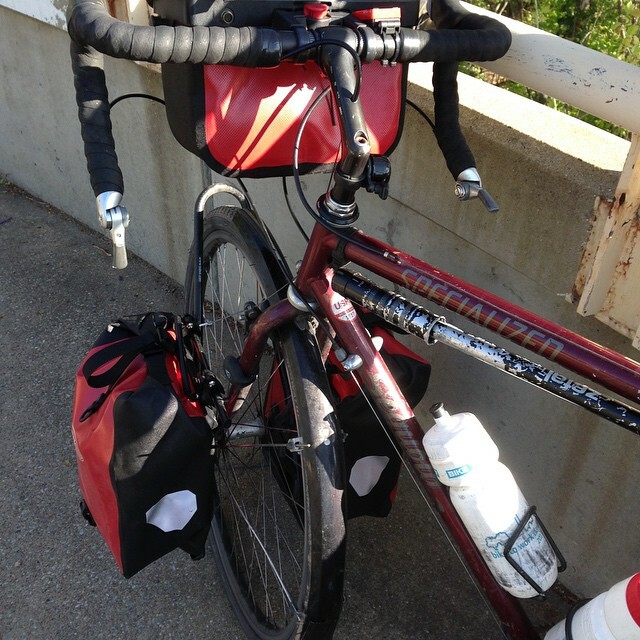 Since the attachment hardware on my panniers cannot easily be switched from one tube diameter to another, I have a set of small Ortlieb roll top panniers set up for use on the front rack. To my surprise they hold very little stuff. I could just fit my work clothes, shoes and a U-lock. The steering was sluggish. The Mule’s steers like a bus anyway so I didn’t have to make much of an adjustment. Between the cold and the increasing foliage, I was in the zone for most of the ride. I totally forgot about the Tulane bald eagle nest. The Belle Haven nest has two ospreys near it. The ride to Rosslyn happened without notice. It was one of those “How did I get here” rides. The Intersection of Doom was another story entirely. Bikes and runners and walkers and cars were going every which way. How I managed to get through it all without a collision is beyond me. A guy on a bike passed me on the sidewalk approaching 19th street. As he did I noticed the walk count down was at 2 seconds. He accelerated into the crosswalk in front of cars waiting to turn right. Dude, you’re gonna die young if you ride like that. The ride home was about 15 degrees warmer. It didn’t feel like it though. As I approached the turn off for the Memorial Bridge, I noticed a big group of loaded bike tourists turning to cross the Parkway. I quickly pulled out my camera, aimed, and….beep. “Battery Exhausted.” So you’ll have to take my word for it. I remembered to stop at the Tulane nest. It is barely visible now. The leaves on the trees obscure the view from the trail. I have landmarks picked out so I will still be able to see it once the trees finish getting their foliage. One other odd thing happened. When I got home and unpacked my cell phone was warm. It turns out that it was in a very tightly packed pannier with no air circulation. I’ll have to make sure I don’t repeat this mistake during the tour. So not a bad start to the work week. And one little detail checked off the pre-tour list. 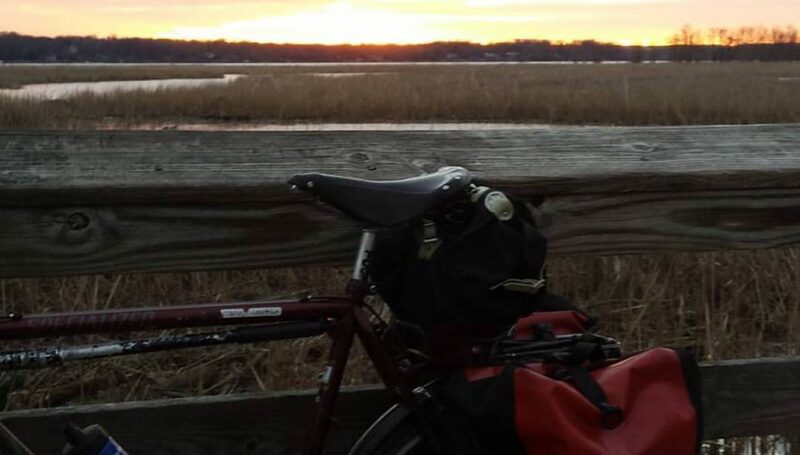 Posted on April 27, 2015 by rootchopperPosted in bike commute, Ortlieb, panniersTagged bike commute, Ortlieb, panniers. Next Next post: En Garde!